Made from grapes, balsamic vinegar is known for its rich flavor and velvety black color. It's fermented in wooden barrels, much like wine, and the taste of balsamic vinegar intensifies the longer it is aged. The thicker and more intense the flavor becomes, the less you need to use to provide a taste boost. Balsamic vinegar offers a number of health benefits, though the serving size is small. According to a study published in "Medscape General Medicine" in 2006, researchers found that balsamic vinegar reduced the hardening of arteries, also known as atherosclerosis. 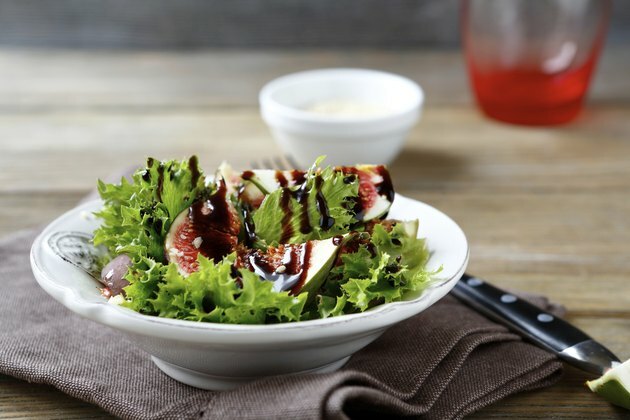 Because of this, balsamic vinegar also lowers and stabilizes blood pressure levels. Researchers in the study found that those who regularly consumed vinegar exhibited lower systolic blood pressure levels. However, further study on humans is required, as this study was animal-based. Low-density lipoprotein cholesterol causes hardened, clogged and blocked arteries. In a 2010 study published in the "Journal of Nutritional Science and Vitaminology," researchers found that the polyphenols in balsamic vinegar limited the ability of LDL cholesterol to oxidize. This reduced the amount of damage done by LDL cholesterol on your body's cells. Foods are categorized as low or high on the glycemic index, based on how drastic an effect they have on your blood sugar levels. Foods low on the glycemic index will not cause spikes in your blood glucose levels, limiting the likelihood that you will experience an energy rush and crash, such as what you might experience from eating large quantities of refined sugar or starches. Balsamic vinegar is low on the glycemic index. Still, a 1-tablespoon serving contains 2.4 grams of sugars, so if you are diabetic, pay close attention to the amount you consume.